If you live “up north,” you know that fall has arrived when the leaves turn color and snow flurries signal the start of winter. In Florida, the changes are much more subtle. But we know for sure that winter has officially arrived when manatees appear at warm water sources around the state. Natural springs, such as Blue Spring on Florida’s east coast, are winter refuges for manatees. When the surrounding waterways get colder, manatees move into the springs to keep warm. Manatees need warm water to survive. In spite of their size, they have relatively little body fat, and their metabolic rate is low compared to other marine mammals. Manatees cannot tolerate temperatures below 20 ° C (68 ° F) for long periods of time. Researchers believe that individuals affected by the cold cannot produce enough metabolic heat to make up for heat loss in the environment. During winters in Florida that have been unusually cold, an increase in manatee mortality has been documented. Because of their susceptibility to the cold, the space or range that manatees require is influenced by seasonal change. Florida manatees are considered to be somewhat migratory animals. Generally speaking, they are found in shallow, slow-moving rivers, bays, estuaries and coastal water ecosystems of the southeastern United States. They can live in fresh, brackish or salt water. In the summer months, manatees travel freely around Florida’s rivers and coastal waters. A few manatees may range as far west as Texas and as far north as Virginia (manatees have even documented in Cape Cod, Massachusetts! ), but these sightings are rare. Sporadic summer sightings in Alabama, Georgia, and South Carolina are relatively common. In the winter, usually November through March, the manatee population is concentrated primarily in Florida. Water temperatures that fall below 21° C (70° F) cause manatees to move into warm water refuge areas. Scientists don’t know what cues manatees follow, but they seem to know when cold weather is coming and seek warm water areas. Travel corridors, or passageways, are necessary for manatees to move back and forth between summer and winter habitats or between feeding and resting or calving areas. It has been documented that many manatees have preferred habitats they return to each year. 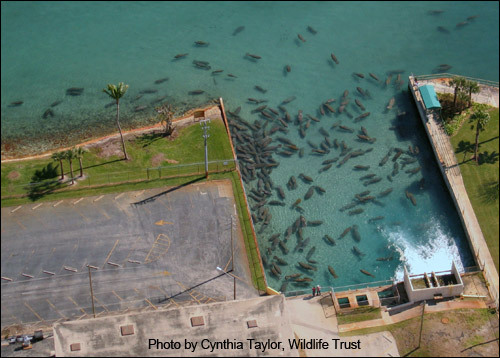 Manatees gather at the warm water effluent of Florida Power and Light Company’s Riviera Beach power plant. When the weather cools down, manatees gather near natural springs such as Blue Spring on the east coast of Florida or in the Crystal or Homosassa Rivers on Florida’s west coast. These springs are winter refuges for manatees because the water temperature is relatively constant throughout the year – averaging about 22 ° C (72° F). 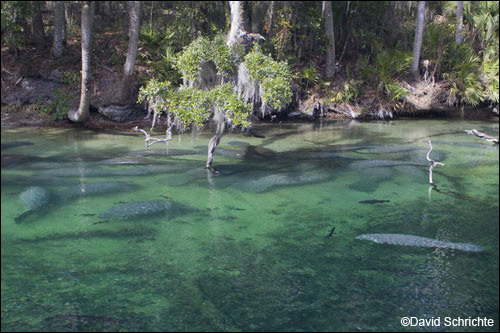 When the surrounding waterways get colder, manatees move into the springs to keep warm. Manatees also gather at warm water effluents of power plants like the Tampa Electric Company in Apollo Beach or Florida Power & Light Company in Ft. Myers or Riviera Beach. Power plants have probably extended the manatee’s winter range. 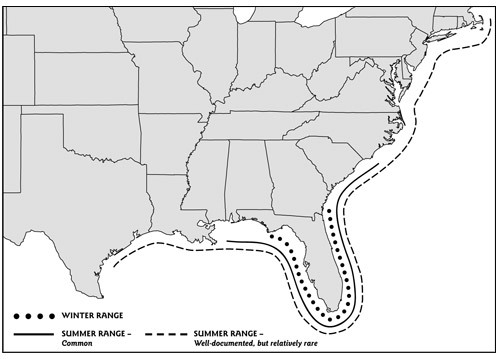 At one time, researchers believe, manatees only ranged south of Sebastian Inlet and Charlotte Harbor in the winter. As coastal development pressures in southeast and southwest Florida have pushed manatees further north, power plant effluents have played a critical role in manatee protection. Unfortunately, warm water sources for manatees are at risk of disappearing as aging power plants go offline and spring flows are affected by Florida’s growing human population and its water needs. Such loss of warm water habitat could result in catastrophic manatee die offs during cold winters. The maintenance of warm water refuges will be an important factor in the manatee’s future survival potential. We need to make sure that spring flows are maintained and devise warm water alternatives before power plants go offline.